Tens of thousands gathered Saturday on the nation’s “front yard,” the National Mall near the Lincoln Memorial, yearning for a bit of that transcendent sense of racial unity heralded on this spot by the Rev. Martin Luther King 50 years ago in his “I Have a Dream” speech. From the memorial steps where King spoke, remarks by a host of early speakers ranging from former NAACP Chairman Julian Bond to the Rev. Jesse Jackson Sr. touched on an myriad themes of voting rights, widening economic disparity, how the issue of race in America, despite so many advances, remains unfinished business to this day. Read More Thousands mark March on Washington. 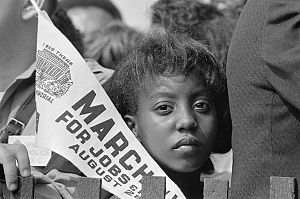 This entry was posted in News from the Soul Brother and tagged Jesse Jackson, Julian Bond, Lincoln Memorial, March on Washington for Jobs and Freedom, Martin Luther King, NAACP, National Association for the Advancement of Colored People, National Mall, United States. Bookmark the permalink.